Microphones are cool. They work on electrical power and they can make your voice sound better, deeper or even sexier. But the mics have to stand on something, especially for recording. 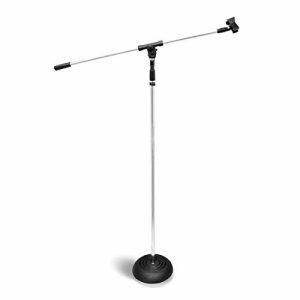 Two factors are the most important for a studio mic stand. Stability provides precision distance to mic and helps the singer forget about keeping up with it. I would include the compatibility of the stand with different mics into the stability category. 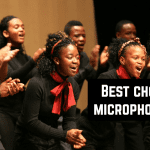 Quality and durability save you cash, and in two ways actually – you don’t have to buy a new stand and you don’t have to buy new mics as they don’t drop on the floor mercilessly. 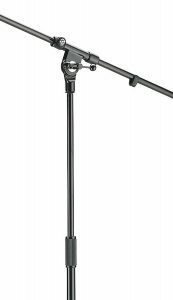 Based on these 2 principles we have come up with a list of 12 best microphone stands for recording. We naturally start with items for people on a budget. With max. microphone clip diameter of 1.26″/32mm, this stand is compatible with most mics. It says on some sites that it’s not compatible with the Blue Yeti USB but remove the incompatible mount first. The stand comes with a small black adapter, a piece of it can be detached and it has the right size to screw into the bottom of the Yeti. Scissor Arm Stand is made of high-quality steel frame. Steel sounds like durability, doesn’t it? That durability is available despite the foldable feature. That would be a third factor – mobility. It’s not really required for recording purposes but certainly nice to have. The table mounting clamp that comes with the stand means you record voiceovers too. Movement is solid and smooth and once you lock down the moving joints it’s quite sturdy. And just like the picture shows you make it work the inverted way. 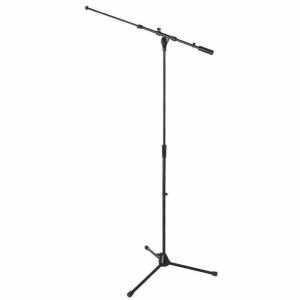 However, because of all the booms that comprise the stand make it look long (or tall), we should warn you that this is not the stand with the longest reach. Another affordable piece of reliable hardware. Shortly put, this is a round-base stand with thread adaptor. Metal clutch with a cast-iron base certainly provide stability and durability. The base is actually so heavy it stands unshakeable even on carpeted floors. Naturally, the stand has height adjustable from 2.8′ to 5.1′. There are convenient features too, like the moveable plastic clip on the stand’s main shaft. That clip keeps the microphone cable tight on the pole. And the top clip is for 5/8″ threaded mic. This stand is actually kind of dual purpose as you can use it as page holder too. But the heavy round base stands are not so good for playing instruments as they are less flexible. 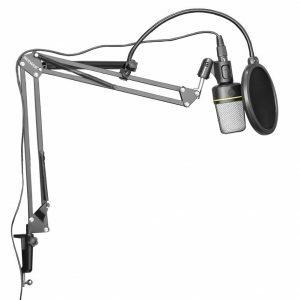 If you spend just a little more cash you can get a good mic stand AND the actual dynamic mic. The dynamic microphone has a smooth mid-frequency presence rise for excellent voice projection. Now, the actual stand has adjustable height from 3.28 – 5.5 Ft. Boom Length is an extraordinary figure of 7.48”. The shock mount system cuts down handling noise. Also, as the picture shows, the stand comes with 15 ft of microphone cable. This included XLR-1/4 jack cable works perfectly with a high impedance mic. Glossy black finish makes you want to hold the thing to take cool pictures, like “I’m swinging my mic together with the stand!” However, the clips that hold the cord to the stand pop off quite often. And the stand weighs only 2.3 pounds, which is not great for stability. You are definitely better of with a weighted base stand when you are looking for affordable price. This heavy stand is perfect for studio and live performances. With this one, you get height adjustment from 37.5”- 59.0′ and boom length of 31.5′. And most people would call it heavy because it weighs 11 pounds. 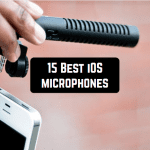 There is a little poblem where the mic slightly swivels from you. 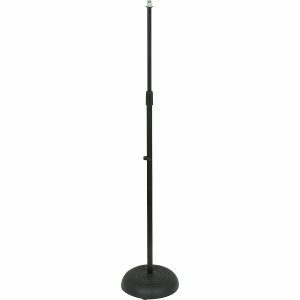 An industry standard, this is the only straight microphone stand that made the list. The durable, rugged design has made it the favorite of both musicians and live engineers. The stand is easily adjustable from 35 inches (87.5 cm) to 64 inches (160 cm) high. Professional quality here. There is a minor thing with the booms unscrewing out of the bases, but it’s OK.
Let’s get to fancier things with more quality and better looks. 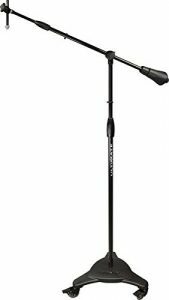 MS9701TBPLUS Platinum is the most stable tripod so far on this list with a base spread of 24 inches. Boom length of 19″-33″ and height adjustment of 36″-64″ are surely sufficient. Materials sound cooler than the ones above too, starting with thick steel tubes. Die-cast zinc clutch and leg housing should never get rusty. Anodized machined aluminum center clutch feels just good as anodized machined aluminum smartphone bodies. Solid steel 5/8-27″ threaded lug will hold any mic with a true grit. And the counterweight is a feature we should not skip in the review. MS9701TBPLUS does not tip because of that counterweight. When you buy K&M Stands you get not just quality but also a strong brand name. This is where an advertiser would use a phrase like “The Industry Standard”. What you specifically get with the 21020 model is zinc die-cast base and swiss steel construction. The height is adjustable from 35-1/2-inch to 63-1/8-inch. 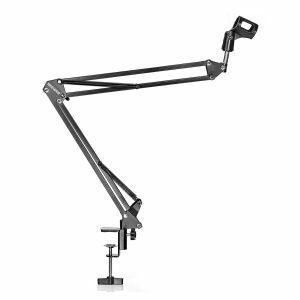 33-inch (1m) fixed length boom arm is one long feature. All that and a 5-year warranty scream “professional”. The K&M Stands 21020 product descriptions usually say it is good for live-sound, touring/production world but it has been proved to be quite good in studios as well. The telescopic tube version of the K&M stand above. Besides all the features I have already given, the K&M 210/9 has an adjustable telescopic boom – 18-inch to 30-1/4-inch. 5-year warranty applies here as well. 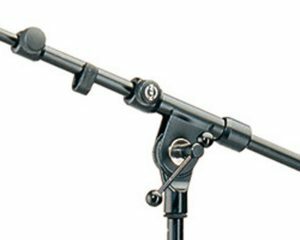 K&M 21021 is a heavy duty stand in a way that it can hold 2 mics simultaneously. People use these stands for years. The most important features are – one-piece boom arm, solid T-Bar locking mechanism, Zinc die-cast base, and longer legs for extra support. This is the choice of professionals. The main stand is 6.5 feet tall, fully extended + 3 feet of the adjustable boom. Sufficient height for overheads. Comes from Germany because it’s Made in Germany. Now are moving to the $100+ category. Only with this one, so far, solid threaded boom ends complete with washers is available. Boom clutch assembly features 2 inch mating disks with 40 locking teeth. Hold things tight. The locking knobs are large and ergonomic. 82 inch Boom with a 7-pound sliding counterweight that locks in place provides excellent control and adjustment. All these features make up a heavy thing. You can attach the boom shafts for professional studios with ample space or remove the front half of the boom and use the back boom for project studios where space is limited. The base extends to 6.5 feet. Normal threaded mic grip receiver holds your mic. Despite the size, you can put the entirety of it into your regular 5 ft speaker stand bag. 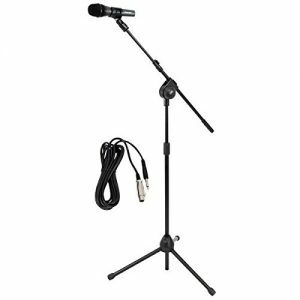 SMS7650 Studio boom mic stand is also heavy and expensive, but it’s also quality. 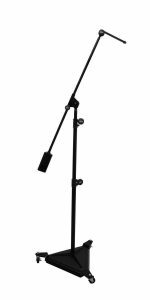 Unlike other mic stands on this list SMS7650 offers removable casters on its 17 lb. base. 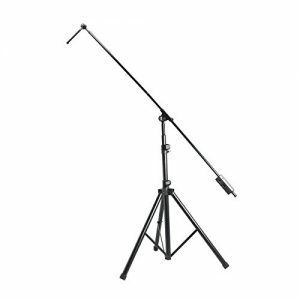 You also get 3-section vertical shaft, height adjustable 40-82″, 82″ boom with steel counterweight, and 7″ mini-boom adapter. You can attach 2 straight boom shafts studio recording. SMS7650 fits any standard microphone. Nice little thing about a wrench that comes included. The top model on this list, MC-125 lets you play with rollerblade-style caster wheels for super smooth movement. Once you are done playing you can completely lock all the wheels. MC-125 also features a 5.75 pound easy to adjust, die-cast counterweight. The height ranges from 52″ to 83″ and the boom can extend from 35″ to 61″ to meet any studio’s needs resulting in perfect placement. 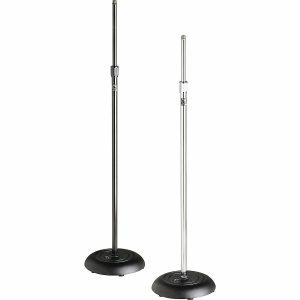 More figures for you: stand height (with casters): 51.5″ – 82.75″ (1308 mm – 2102 mm), boom length: 35″ – 61″ (889 mm – 1549 mm), caster diam. : 3.75″ (95 mm), base diameter: 22.5″ (572 mm). Unfortunately, it works perfectly only with one mic attached to it.